I admit it - I'm kind of a girly-girl. Pink is my favorite color, I love skirts/dresses and I can’t help but oohh and ahhh over anything with a ruffle on it. 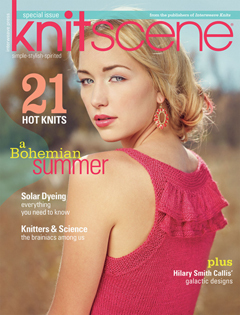 So when the new issue of knitscene arrived on my desk, I just about passed out. Right there on the cover was a super cute tank top with ruffles! The best part? The ruffles are on the back of the racer-back tank, so you don’t feel like an overgrown doll. The Mackinac Tank by Danille Chalson is knit with Firefly, a linen and rayon blend, perfect for summer layering pieces. The ruffles are knit as part of the back and are made with simple decreases and a clever use of joining-as-you-go to reduce finishing. I also really love the Lindell Tee by Cassie Castillo. Knit in Classic Silk, it's a short sleeved tee with a deep scoop neck and a slightly flared peplum, highlighted by a garter band at the waist. The body of the tee is knit in the round, so it's sure to be a fast and flattering knit. With its classic style and simple construction, this tee will take you from early spring to late fall. At some point I'm going to have to learn to knit in my sleep, so I can make all the great designs that keep being published! Photos courtesy of Interweave Knits. Photographer Nathan Rega of Harper Point Photography.